I’ve got a bit of a thing about liquorice at the moment. It’s an acquired taste, I know. You can add three liquorice herbs to your garden very easily – fennel, dill and french tarragon. You can buy plants or sow fennel and dill from seed. 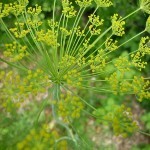 Fennel and dill will seed freely, which means they will be a useful weed in your garden forever. Tarragon will die back in winter but grow back again in spring. If you’d like to add these and other herbs to your edible garden, it’s time to come on the fresh food garden course. The more I use the ‘cook’s herb garden’ book, the more I like it, because they talk so much sense. I tried their tarragon aioli and it was wonderful. It was even better as a pasta sauce with a few mushrooms and some chicken the next night. I’ve just sown some florence fennel for winter brasing. Then there’s Black Adder liquorice tea and pastis (the anise-flavoured liqueur from France) to drink. Don’t forget RJ’s liquorice choc logs, with the chocolate neatly on the inside to avoid those chocolate sprinkles on your pants (by which I mean trousers of course). I’m using lots of caraway and fennel seeds, chinese five spice and star anise in cooking. Now I’ve invented fig and fennel seed biscotti. It was loosely based on a recipe from Jo Seagar’s ‘You Shouldn’t Have Gone to So Much Trouble, Darling’. Did I tell you I’d developed a thing about figs too? I’d have added some Buderim crystallised ginger to the biscotti but I’d used it all in fig and ginger muffins. Next time maybe.